Casual, crave-satisfying American fare courtesy of Douglas Keane and Nick Peyton. 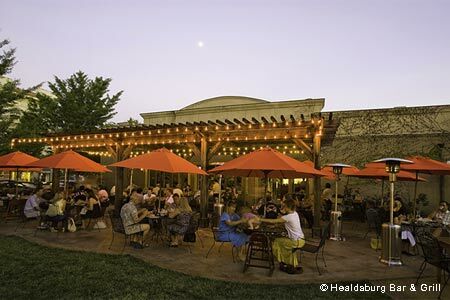 : Launched by Douglas Keane and Nick Peyton, Healdsburg Bar & Grill goes by the nickname HBG to embody its casual ethos. This isn’t haute cuisine in folksy and familiar disguise as found at Market, the Napa bistro they formerly owned (though there are a couple of smart menu carry-overs such as naughty adult mac ‘n’ cheese and butterscotch pudding). Instead, HBG is a joint to put cravings to rest, where the menu reads like pub food with pizzas, sandwiches and burgers. Half-pounders get a jump-start from toppings such as bacon, Fiscalini cheddar or avocado --- but the Angus beef is a surprising wallflower, with no zing of its own. Flatbread pizza loaded with cheese comes too doughy at center. Winners hail from the starters section: juicy sliders on Dutch crunch rolls with cornmeal crisped onion slivers; smoky, can’t-stop truffle fries; wings that are crispy outside, juicy in, with a tangy hot sauce coating. Watch the game at the bar, or passersby from under cheery red patio umbrellas. Half barrels frame a lawn ideal for restless kids. The wine list offers “patio” choices to sip from stemless glasses. Lazy weekends were made for build-your-own Bloody Marys with breakfast. Amateur service needs tightening.